Classified ADS (CLADS) is an annual symposium pioneered by UP ADS which shows different ways an individual or a group of people can contribute to the development of the country. This semester’s theme focuses on the influence of content-makers in social media in relation to development. Before, ​social media​ ​was used to connect people; now, it has evolved to an avenue for entertainment where humor on daily lives and struggles of people are the common themes. Fast forward, social awareness has been infused in the equation. ​In​ ​hopes​ ​of​ ​encouraging​ ​the audience​ ​to​ ​patronize socially​-​relevant​ ​content​, the symposium​ ​will tackle the rise of content-making in various social media sites. Three key persons namely Andoyman, Henri Igna, and Aron Garchitorena were invited as resource persons for the symposium. 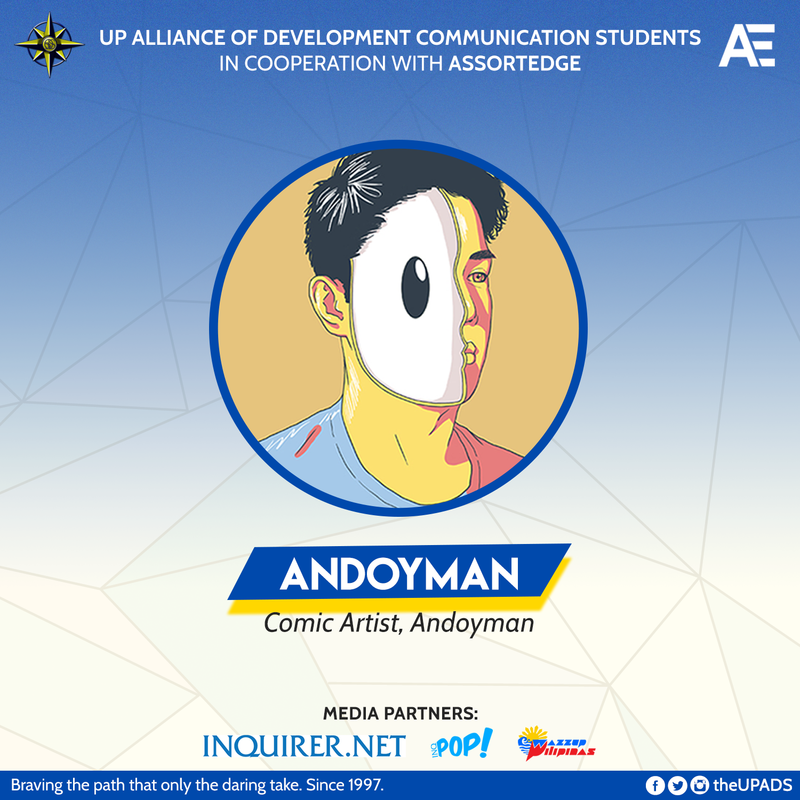 Andoyman is the digital artist behind the viral artworks condemning extra judicial killings (#StopTheKillings) and the atrocities of the former dictator (#MarcosArtrocities). His talk will focus on the inspiration and motivation behind his thought-provoking artworks. 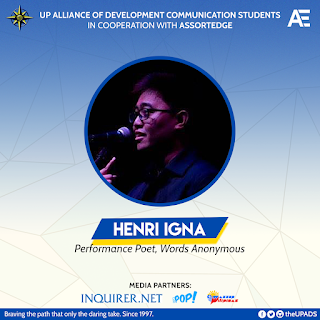 On the other hand, Henri Igna uses a different form in addressing social issues. He uses spoken word to bring attention to the challenges the country faces today. 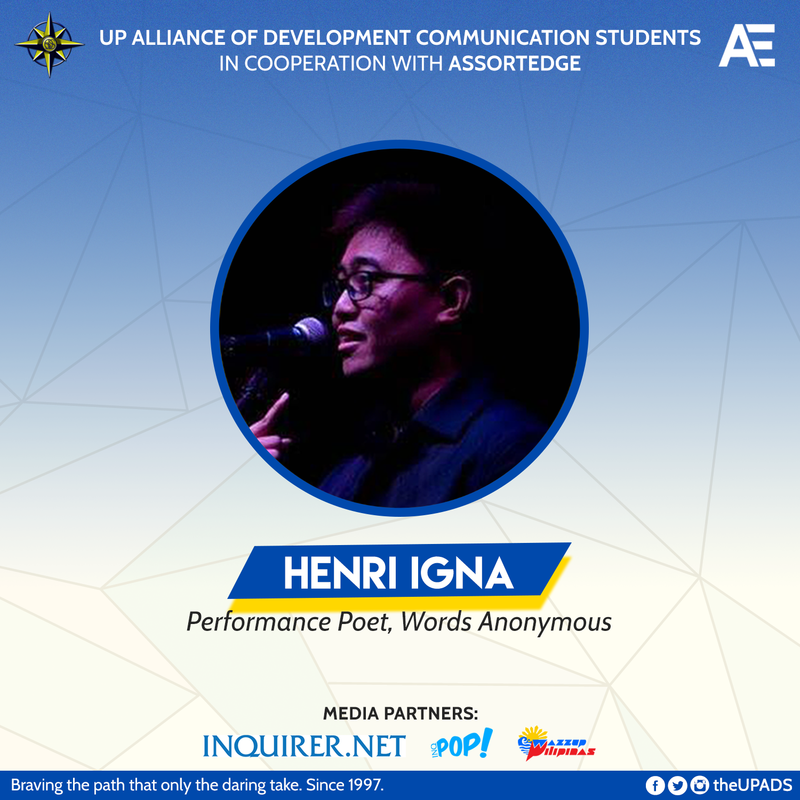 In 2015, he became a part of Words Anonymous where he performs spoken word about love, LGBT rights, mental health, and social equality. His talk will be about using the power of words to move people into critical thinking. 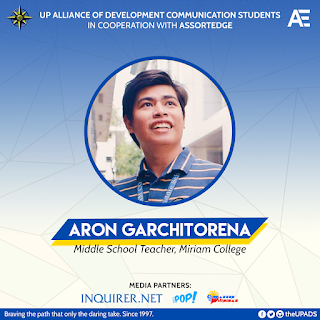 And to give light on how these content-makers establish relevance in social media, Aron Garchitorena will explain how content-makers manage to get the influence they possess. 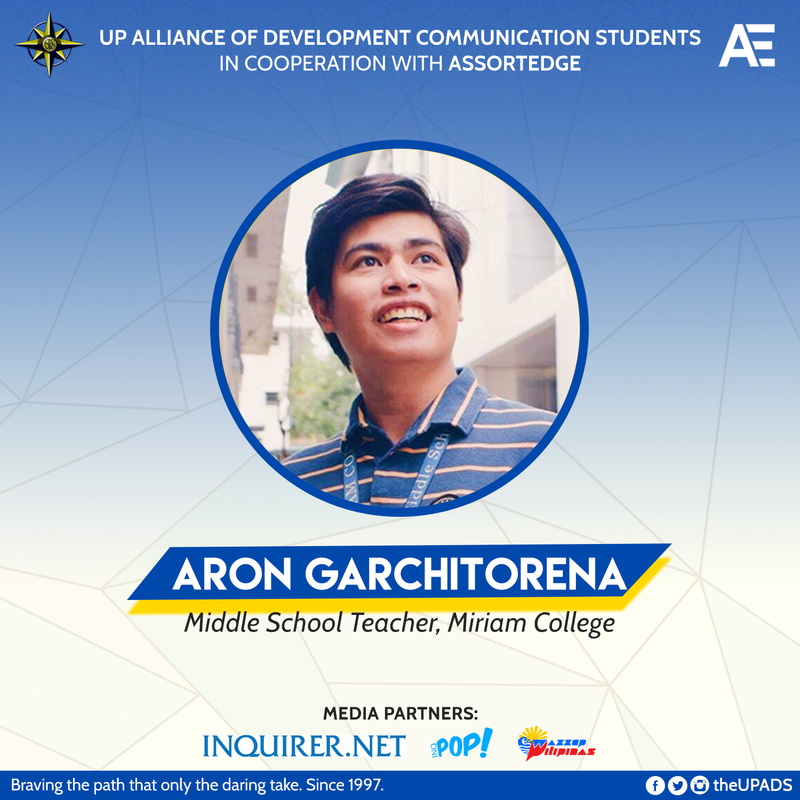 He is a middle school teacher in Miriam College and is currently pursuing his Master’s Thesis for Philippine Studies in the University of the Philippines Diliman Asian Center, where he specializes on Socio-cultural studies. 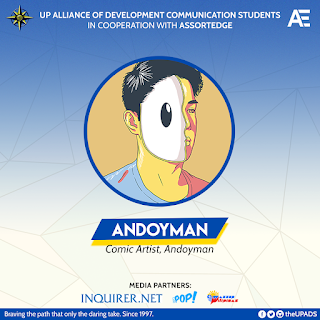 With a research background on pop culture and social media, his expertise can give light on how content makers in social media raise awareness through their medium. With the vast reach of social media and the concern of the people using it, social issues faced by the country are now being given the attention they deserve. The information needed by the people to voice out their opinions are delivered to them in the way they can comprehend and appreciate the most. 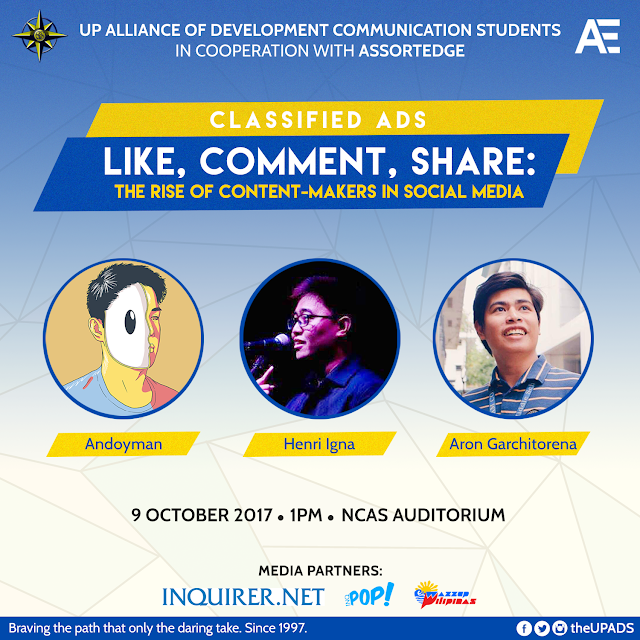 Understand this phenomenon of social media information only at Like, Comment, Share: The Rise of Content-makers in social media, this October 9, 1 - 4 PM, at the NCAS Auditorium, University of the Philippines Los Baños. Content has always been a part of marketing. You can't do free online advertising of your business without content not even paid advertising. This is nice post.Thanks for sharing hotmail account. Here are some extraordinary tips for social media promoting that'll enable you to make an appropriate mind-blowing web-based life content utilizing only your webpage.